beautyamare: Vintage Roses Nail Art Tutorial! Vintage Roses Nail Art Tutorial! Tired of the usual french-tipped nails and the ever mono-toned nails?Let me spice up your nails by adding vintage roses design to it! Step 1. 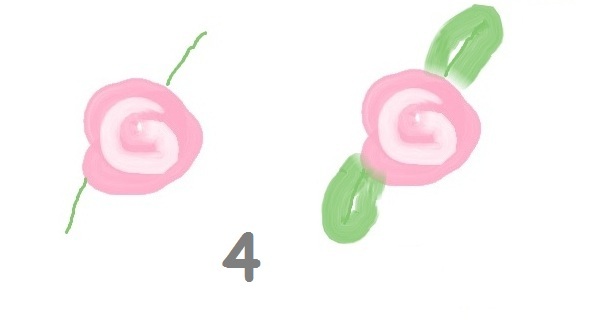 You may get the colors ready at hand to paint the nails, preferably the colors that you want your rose to look like, and as for me I want it to be PINK. Step 2. It is advisable to use a dotting tool but if you don't have one, you can use a home alternative like a hairpin, a toothpick, or the round edge of your makeup brush, or like me I usually use the round edge of my old camera connector. If your dotting tool is too thin like a hairpin, your stroke must be twirling. Since the edge of my camera connector is just enough to draw the shape, I just usually dot dot to my nails until I get the rose shape. Once you get the desired shape,let it dry. 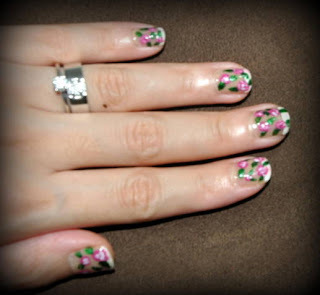 (use the white nail lacquer now) inside the flower to create a 3D illusion of the petals. Please see blow illustration of detailed illustration. Step 4. Now, it’s time to create those little leaves using your color styler (you can use an alternative like toothpick) ; you can have as many leaves as you want. It is best to fill your nail canvass with these little green leaves. Having trouble creating these leaves? What I usually do is create a straight line, then create a little semi-circle in both sides then fill it with color. Let it dry. and will give a soft and glossy effect. DONE! You can now enjoy wearing this nail design. I actually wore this nail design last weekend, and was complimented with how cool it looks. Now it’s your turn to re-create this design. You can post your comment below or you can tweet HONEY your picture showing this nail design. Follow her in twitter account @urhoneyness and comment using hash tag #vintagerose. 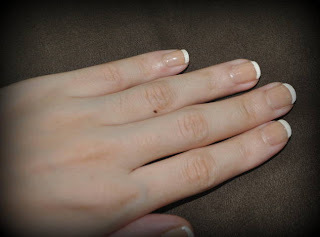 Don’t forget to join beautyamare.com for more beauty, fashion and nail art ideas.